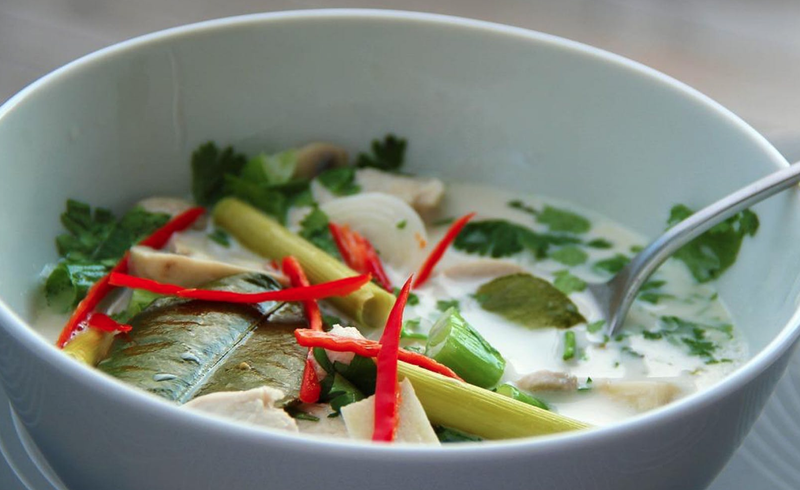 Next to the popular noodle dish, Pad Thai, the rich and fragrant soup known as Tom Kha Gai (chicken-coconut soup) is one of Thailand’s best-loved dishes. Thai cooking relies on five essential flavors – sweet, sour, salty, bitter, and spicy (and sometimes creamy). You’ll incorporate each of these with an array of familiar and exotic ingredients. At the end of class, share a bowl with your classmates and take a quart home to enjoy with your family – it’s even better the next day! Students ages 7 and younger must have an adult remain in the kitchen at all times. All parents are welcome to stay, watch, participate and eat! Please contact us directly at [email protected] with any food allergy or safety issues. Classes are $45. Contact 1400 Food Lab regarding a discount for signing up for all three Asian cooking classes in advance. Food for Thought Kitchen is run by Carrie Klug and Olivia Hickey. Carrie has loved cooking since childhood and has years of experience in restaurants as well as running her own baking and catering service. Olivia learned to cook while studying in Italy and brings her knowledge of psychology and her experiences as a teacher to the partnership. They are friends and working parents who want to offer their love of cooking, learning and everyday adventures to central Ohio. Students throughout Columbus are welcome, and our classes are particularly convenient to Hilliard, Upper Arlington, Marble Cliff, Grandview, OSU Campus area, and Clintonville.